Saturday, November 5 – Sunday, November 6. Maui Comic Con. First ever comic convention on Maui. Cosplay contest, featured artists, and celebration of Darkwing Duck. Lahaina Cannery Mall. Free! Open to the public! Saturday, November 5, 9 am – 7 pm. Maui Yoga Festival. 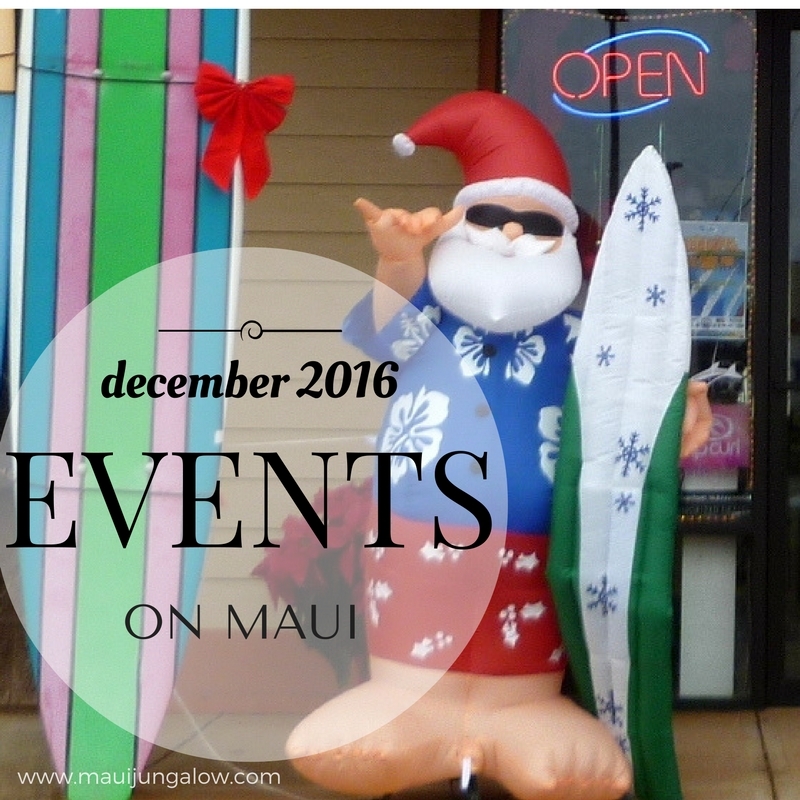 Yoga classes for all levels, plus Hawaiian chanting classes, Ayurvedic lectures, live music, and dance performances. $40+ Makawao Union Church, Makawao. Saturday, November 5, 9 am – noon. Arbor Day – 1,000 Hawaiian Tree Giveaway. Bring a free Hawaiian tree home with you and other Hawaiian cultural activities. FREE! Maui Nui Botanical Gardens, Kahului. FREE ! Saturday, November 5, 6:30 pm. 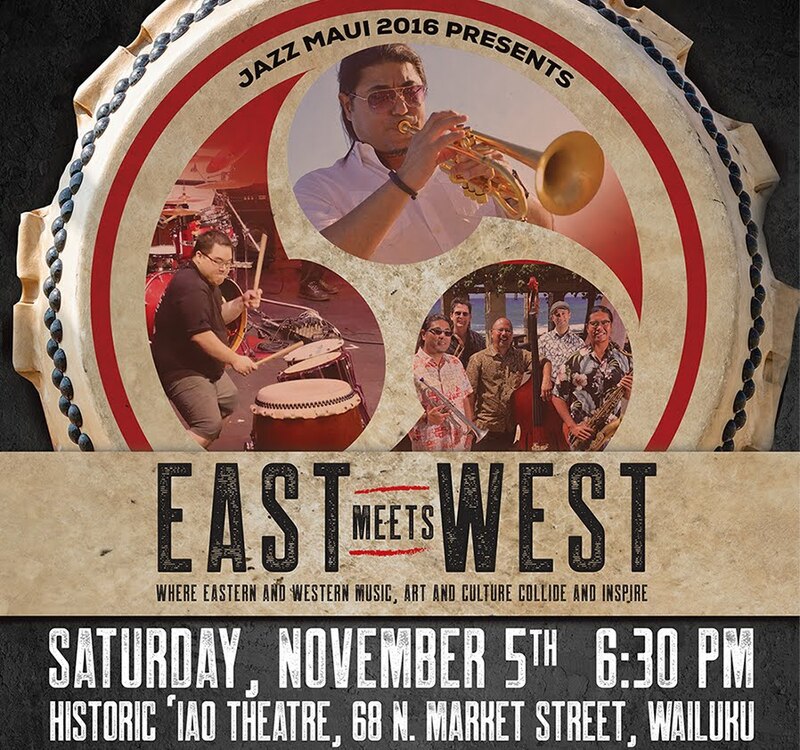 Jazz Maui: East Meets West, featuring some of the best jazz musicians in Hawaii like DeShannon Higa and the Hawaii Jazz All-Stars. Iao Theater, Wailuku. $15 and $25. Saturday, November 5 – Sunday, November 6. Mini Maker Faire at Barnes & Noble with Maui Science & Discovery Center team. Learn from each other and from experts, explore the Launch Lab and other activities. Barnes & Noble, Lahaina. Sunday, November 6, noon – 4 pm. Fall Family Festival and Pie Tasting Event. Silent auction, live music, hay rides, and pie tasting! Free. La’akea Farm, Paia. Sunday, November 6, 2 pm – 5 pm. Upcountry Sundays Acoustic Style, a fundraiser for Manao Radio. Enjoy dancing and live music with Soul Kitchen Maui, Jamie Gallo, and Stephanie Falcone at Casanova in Makawao. $10. $7. Thursday, November 10, 9 am. 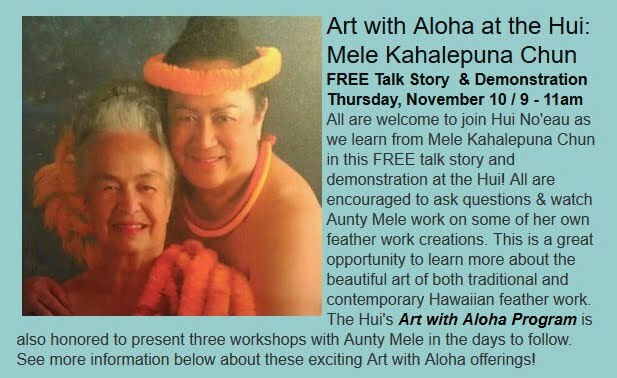 Art with Aloha: “Talk Story” and Demonstration by Mele Chun. Mele is a master of the Hawaiian art of feather lei making. Hui Noeau Visual Arts Center, Makawao. FREE! Friday, November 11 - Sunday, November 13. 1st Annual Maui Chefs Invitational. A culinary adventure featuring 8 chefs and three different events. The Mill House Restaurant, Wailuku. Friday, November 11 – Saturday, November 12, 2 pm – 8:30 pm. Sun Yat-Sen Festival. Lahaina honors Sun Yat-Sen with music performed on Chinese instruments, martial arts demo, calligraphy, educational displays, lecture, Chinese food, and free museum admission. Wo Hing Museum, Lahaina. Saturday, November 12, 8:30 am – 4 pm. Zip For The Trees. 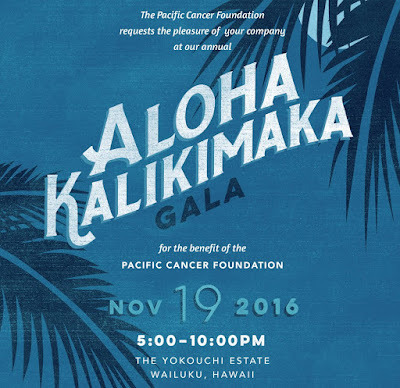 Benefit for Maui charities. Enjoy 3 ziplines and a swinging bridge for a special rate of $50. Live music by Paula Fuga and others. Skyline Ecoadventures,Kula. Saturday, November 12, 10 am – noon. Waihee Shoreline Cleanup. 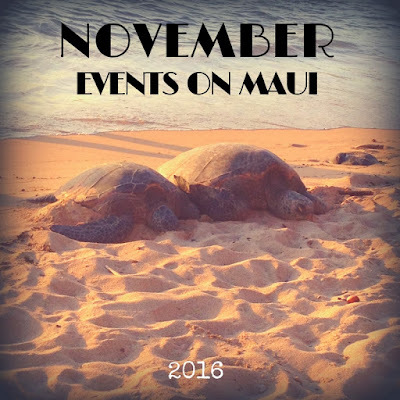 Hosted by Malama Maui Nui and HILT, help cleanup the debris that washes ashore in this area. Potluck afterwards. Waihee Coastal Dunes and Wetland Preserve, Wailuku. Saturday, November 12, 6 pm – 8 pm. Piano Recital: An Evening in Rio. 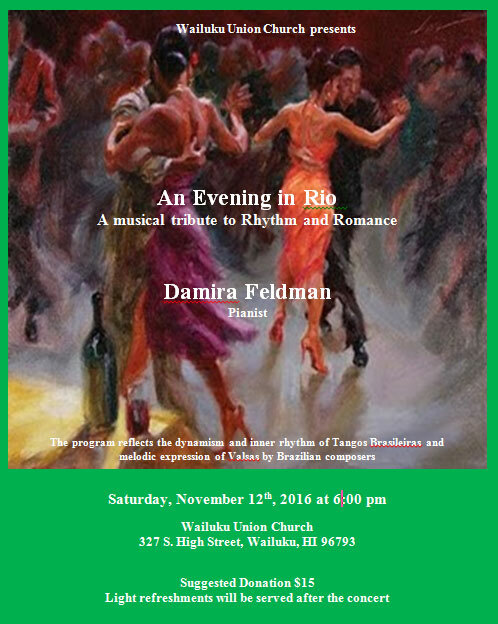 Musical Tribute to Passion and Romance with Russian pianist Damira Feldman. Suggested donation $15. Wailuku Union Church, Wailuku. Saturday, November 19, 5 pm – 10 pm. Aloha Kalikimaka. Celebrate a “Blue Hawaii” and step back into the 1950s, a benefit for the Pacific Cancer Foundation. $200. Yokouchi Estate, Wailuku. Saturday, November 28, 9 am – 5 pm. Fundraiser for the Bailey House Museum. Beautiful Hawaiian music and hula, 40 + crafters and food vendors, cultural demonstrations and special exhibits. $10 in advance, $15 at the door. Hale Hoike (formerly the Bailey House Museum), Wailuku. Saturday, December 3 2016, 8 am – 3 pm. Maui Bird Conservation Center’s Open House. Makawao. FREE ! Reserve your tour in advance. 1st Sunday of the month, 2 pm. Upcountry Sundays Acoustic Style by Manao Radio at Casanova, Makawao $7. 2nd Monday of the month, 6:30 pm. Barefoot Essential Theater (BET) and One Night Only – ONO performance: play readings, comedy nights, poetry readings. Iao Theater, Wailuku. FREE. Wednesdays, 4 pm – 7:30 pm. Outlets Outdoor Market. Farmers market and crafts. Outlets of Lahaina.